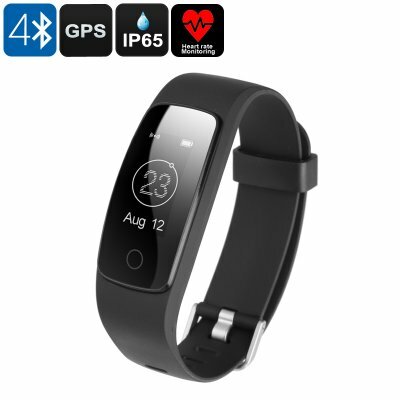 Successfully Added Bluetooth Fitness Band - Bluetooth 4.0, 0.96 Inch OLED Display, IP65, Heart Rate Monitor, GPS Connect, Sedentary Alert (Black) to your Shopping Cart. Increase your fitness levels and work towards a healthier future with this beautiful fitness band. Thanks to its accurate heart rate monitor, this fitness tracker is capable of keeping constant track of your health and stamina. Allowing you to keep track of your heart rate during your upcoming workout sessions, this fitness tracker provides you with valuable information on which to base the intensity of your upcoming exercise. From now on you can be sure that you’ll always train in the most efficient manner and gain the fastest results while working towards the fitness level of your dreams. Compatible with both iOS and Android smartphones, this Bluetooth sports band can be efficiently paired with your mobile device. Once synchronized, it will keep you constantly updated on incoming phone calls and messages. The mobile application furthermore provides you with valuable information on your previous workout that helps you to analyze your sporting sessions. Additional features such as guided breathing, heart and lung analysis, and sedentary reminders are in place to further increase your overall user experience. Thanks to its tough IP65 design, this fitness band can be used in virtually any environment and weather condition. Whether you go out for a run in the rain, skiing trip in the icy mountains, or a bike ride on a dusty country road – nothing will stop this fitness tracker from working. Thanks to its multi-sport mode, this fitness band is perfect for anybody no matter the type of athlete you are. It furthermore packs a powerful 65mAh battery that brings along enough juice for 15 days of standby time. Thanks to this, you’ll be able to enjoy all its features for days in a row without needing to worry about battery life. This fitness band comes with a 12 months warranty, brought to you by the leader in electronic devices as well as wholesale electronic gadgets..